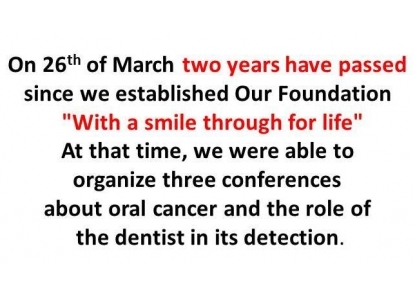 2 years of Foundation "With a smile through for life"
In March 2011, on the initiative of individuals involved in the dentist market established the Foundation “With a Smile for Life” which helps fight against oral cancer. The sign of the Foundation is a blue ribbon, because blue symbolizes water, brings joy and peace. • great importance of the dentist role as a practitioner in the prevention of cancer. FOUNDATION "With a Smile for Life"